<p”>Our Champagne Nail Bar offers a full range of the best gels, acrylics and polishes on the market today, and our experienced staff will pamper your hands and feet while you sip on champagne or catch up with your friends. Spoil yourself with a glass of bubbly, try one of our tasty treats, a homemade cake and a signature herbal tea or our barista can serve you a delicious coffee while you relax and watch the world go by. 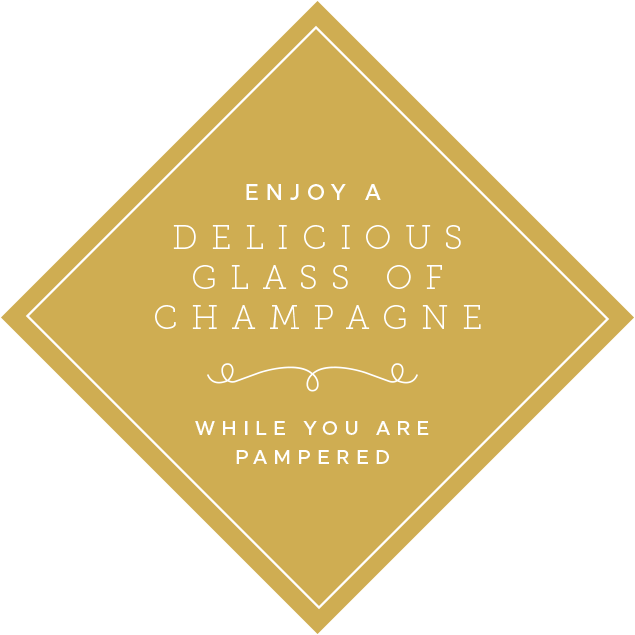 Why not treat yourself to our signature Royal Manicure or Pedicure, all washed down with a glass of champagne! Indulge with one of our beautiful Add Ons, from Chocolate Paraffin Wax to our beautiful Glitter Ball treatment leaving your skin with a shimmery, flawless glow. Why not take a drink outside and relax after your treatment in the Champagne Nail Bar and enjoy our beautiful outdoor space? Whether it’s a Royal Gathering for a special occasion or simply a fabulous place to get ready for a big night out, our Champagne Nail Bar is perfect for groups of all sizes to relax, have fun and spend some quality time together. We’ll make sure the drinks are flowing so you can really let your hair down and enjoy yourself! Ask us how we can make your party personal, from cheeky little add ons to themed cocktails; it will be an event to remember! Ideal for those who are requiring a longer lasting manicure. Includes: nail and cuticle grooming, gel polish of your choice then finished with a relaxing hand and arm massage. Includes nail and cuticle grooming, hand and arm massage and as many glasses of prosecco as you like within the appointment time. True indulgence for your hands! Includes: nail and cuticle grooming, hand and arm massage, paraffin wax, a choice of polish or shellac gel polish and a glass of bubbly or hot drink if you prefer. Treat your hands to a wonderfully chic nail shape and paint to the fingers using our superior quality polishes. Enjoy a longer-lasting colour to your nails with our chic nail shape and gel application in the colour of your choice. Includes: a Royal foot cleansing ritual, hard skin removal, foot scrub, nail grooming, cuticle treatment and a royal foot massage, finished off with the perfect polish to your toes. Includes nail and cuticle grooming, gel polish of your choice then finished with a foot scrub and massage. Ideal for those who are requiring a longer lasting pedicure, shielding the natural nail from breakage. NEW Includes nail and cuticle grooming, foot soak, exfoliation, muscle-melting foot massage followed by a cooling gel to finish. Includes hard skin removal, foot scrub, foot mask, nail and cuticle grooming, royal massage and a choice of polish or Shellac gel polish and a glass of prosecco or hot drink if you prefer. Treat your feet to a wonderfully chic nail shape and paint to the toes using our superior quality polishes. Enjoy a warm foot soak, scrub, tidy of nails and cuticles, finished with a relaxing foot massage and traditional bottle of beer. *Must be taken as part of a pedicure. The perfect treatment for very dry hands or feet! We exfoliate and envelope your hands or feet in warm paraffin, naturally infused with vitamins that leave them beautifully soft and silky smooth. Shellac removal is complimentary if taking a Royal gel pedicure on the same day. Includes a glass of chilled prosecco. Shellac removal complimentary if taking a Royal Gel manicure on the same day. CND overlays coat your nails, giving gorgeous colour and protection as they grow. Available for hands and feet. also receive a relaxing mini shoulder massage while the paraffin works its magic. (Only available when choosing the hand treatment).